Essential oils are are the geek-gone-chic of the health community. They’re moving out of the hippie tent and into normal, average homes across the country, if not the globe. Even celebrities and mainstream magazines are talking about essential oils. Are these oils for you, though? Before you jump on the oily bandwagon, you better check out these reasons to avoid essential oils. 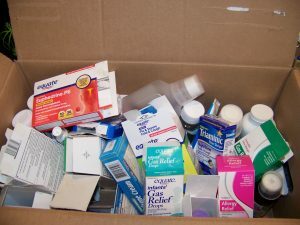 You don’t want more room in your medicine cabinet. Suddenly, things used daily or weekly just become obsolete and unnecessary, either because you are healthier or because you’ve found better solutions. But maybe you like the cluttered look. You like dealing with those nagging little problems. You know the ones I mean. They aren’t serious enough to pop a pill or go to the doctor, but they sure are irritating. Essential oils can help, but you wouldn’t want that! You don’t want to make your own personal care products. Maybe it never crossed your mind, but there is very little testing and regulation on the beauty industry. Our bodies absorb whatever we put on our skin. If you don’t like knowing what is being absorbed, pass on this. You don’t like multitaskers in your life. With only a few essential oils, you can support numerous systems and functions in the body–you don’t need a huge collection. If you think multitaskers are a drag, don’t look into essential oils. You don’t want to support wellness at its roots. Why use something that can support health and wellness at the cellular level when you could just mask the symptoms instead? Plus, all those things that mask symptoms have side effects that make life interesting. 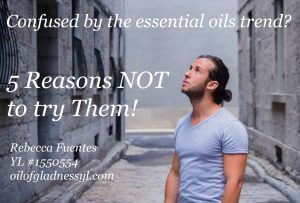 That’s it–five solid reasons to stay far away from essential oils, especially the highest quality, purest, most effective oils like Young Living produces. Or maybe, you like clear cabinets, better days (and nights), and knowing what’s on your skin. Maybe you’re one of those people who likes multitaskers and thinks getting to the root of the problem is the way to go. If that’s so, you might just be ready to be oily, too.